Several members of the WOSU Friends Board congratulate Cindy Gaillard as the 2018 Higgy-Tyler Award honoree at the WOSU holiday party. The Ohio State University Board of Trustees holds the license to all WOSU broadcast properties. OSU Trustee information including board membership and general and committee meeting schedules can be found at trustees.osu.edu. The Friends of WOSU Board, an advisory group of central Ohio citizens, acts as a liaison between WOSU Public Media and the community. 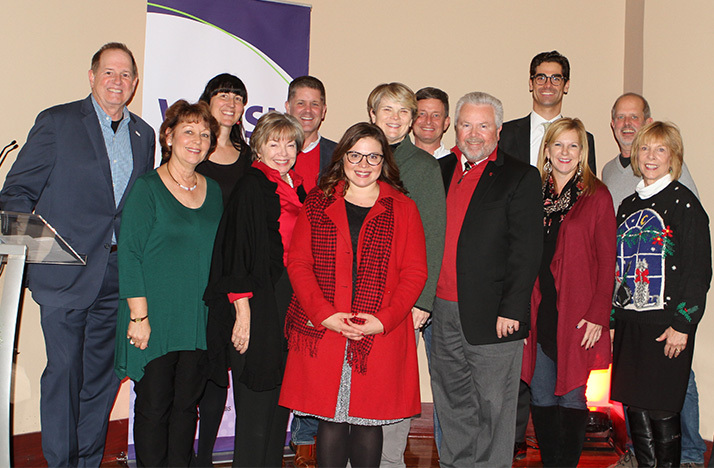 The board serves as a link to and from the community-at-large, gathering and sharing information and opinions on area issues, needs and strengths with the community, staff, management, and board; cultivates sources of funding while promoting memberships, sponsorships and donations through special events and other activities; and supports communication of WOSU goals among members of the Friends of WOSU, the larger community and The Ohio State University. Meetings of the Friends of WOSU Board are open to the public. However, portions of some meetings may be closed in order to address confidential information or proprietary matters. Unless otherwise specified, the meetings begin at 5pm and are held in the Multipurpose Room at WOSU Public Media, 2400 Olentangy River Road, Columbus, Ohio 43210. Please contact Joan Duffey at 614.292.9678 or joan.duffey@wosu.org to confirm meeting dates and times or to request additional information.